Almost a full year ago, I declared blogging was going to be all about me in 2007. I was only going to write about what I wanted to write about. I was going to write the same content whether 40 people were reading or 40,000 people were reading. I think I did just that. Blogging was fun again in 2007. It felt as if I blogged less in 2007, so I extracted some metrics to learn if that was in fact the case. It wasn't. Here are the number of entries for every year this blog has existed. As you see, I've already written more entries in 2007 than I did in 2006 and there are still ten days to go. 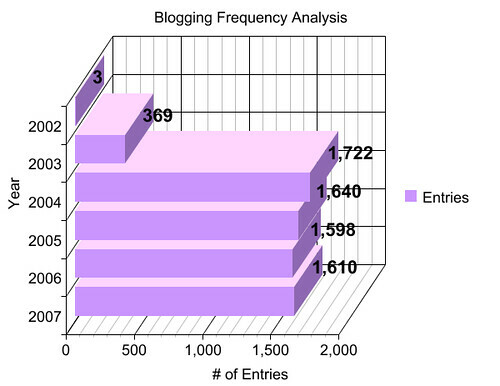 I'll likely surpass the 1640 entries I wrote back in 2005 making this my second most prolific year of blogging. My personal best from 2004 is safe.... for now. Just out of curiosity, how many hits do you get on an average day? Asking a blogger their unique visitor count is like asking a woman her weight. My average daily unique visitor count is a number between 1000 and 100000. That's as specific as I'll get. Yeah, fair enough. My bad. This is why they say things like, "Curiosity killed the cat."